ISLAMABAD: Interior Minister Chaudhry Nisar Ali directed the chairman of Pakistan Telecommunication Authority (PTA) on Wednesday to ensure that social media was being used for healthy interactions instead of maligning “sacred” institutions and personalities. The interior minister ordered the head of the authority to formulate standard operating procedures (SOPs) for a framework which could ensure that social media was used as a medium for “promoting exchange of ideas and not as a tool to propagate false information, ridiculing sacred personalities, national institutions or jeopardising cultural values of any community”. Nisar also asked National Assembly Speaker Ayaz Sadiq to convene a meeting of all political parties to develop a consensus on the matter and formulate a framework. The minister gave the directives at a meeting with the interior secretary, the PTA chairman , the National Database and Registration Authority chairman, the Islamabad police chief and senior officials of Federal Investigation Agency, the Islamabad Capital Territory police, and the interior ministry. Nisar also directed the Foreign Office to contact the Organisation of Islamic Cooperation general secretary for holding a meeting on the issue of blasphemous content on social media as discussed during the dignitary’s last visit to Pakistan. 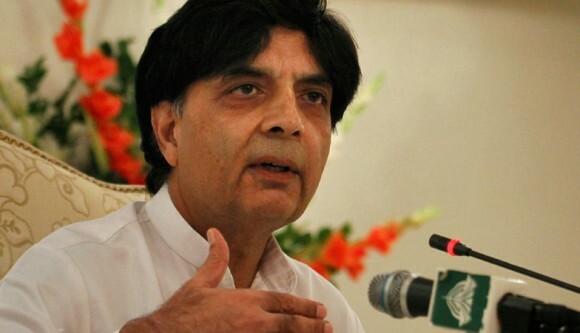 “Being a democratic government, it it is our obligation to ensure and protect the right of every citizen for the freedom of expression but we are equally bound by the law and constitution of the country to protect our citizenry and institutions from the assault which is carried out through social media under the garb of the freedom of expression,” Nisar maintained. He added that the right to free speech was linked to a sense of responsibility and ownership. “[Social media] Users feel no qualms over misusing their right of expression and thus infringing the rights of others who are deeply affected by their imprudent actions,” he noted. The minister gave one week to the PTA to prepare the SOPs so that they could be reviewed by the departments concerned. His directives come in the wake of several arrests and alleged warning calls by the FIA to the social media users, who have been using the platform for voicing their opinions on political and other matters. On May 21, the agency first arrested some people to question them about their social media posts against the armed forces and state institutions and later released them. Strangely, the action was taken by the Counter-Terrorism Wing of the FIA instead of its Cyber Crime Wing, sources told The Express Tribune. A top FIA official, requesting anonymity, said six people were summoned for questioning by the agency for their tweets and posts against the armed forces on social media. However, the agency did not formally charge anybody or make any arrests, the official added. People in different parts of the country were taken into custody. The official said more arrests were likely to take place in the coming days.